Buenos Aires (Agenzia Fides) - "How many times have we reflected on the words of the book of the prophet Jeremiah: 'Before I formed you in the womb I knew you, before you were born I dedicated you, a prophet to the nations I appointed you" (1.5). We feel immensely loved people, with a mission, a project that we discover and build during our daily journey. This is why once again we reiterate with great hope that every life has infinite value in the eyes of the Father, it is a gift of his goodness". This is how the Argentine Conference of the Religious (Confar) expresses itself in a statement sent to Agenzia Fides, "in defense of the dignity of every person". 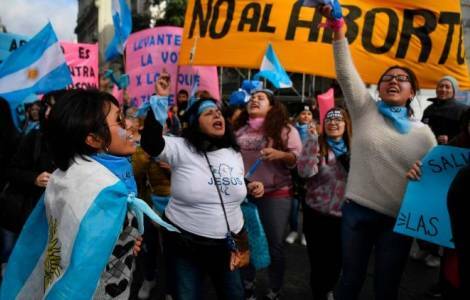 In these days the Argentine Senate is discussing the bill that decriminalizes abortion, already approved by the Chamber of Deputies on June 14, allowing it in a "safe, legal, free" form for every woman who requests it within the fourteenth week of pregnancy. After this period, it is only possible in the case of sexual violence, if the mother is in danger of life or if the fetus has any form of malformation. The text is now being examined by the Senate. The members of the Governing Council of Confar, "support the defense of the dignity of every person in the face of all forms of slavery and rejection" and join with what the Bishops said in the Eucharistic celebration on Sunday 8 July in Lujan, where the Mass for life was celebrated: "life is a pure gift from God and therefore must be respected, cared for, defended and served" (see Fides 28/6/2018). ASIA/CHINA - During the Marian month, new workers in the "most isolated vineyards of the Lord"